Full service audiology care for hearing loss and hearing aids. Do you feel embarrassed when you meet new people because you struggle to hear? Hearing loss is a major public health issue that is the third most common physical condition after arthritis and heart disease. * Exclusion from communication because of hearing loss can have a significant impact on your everyday life. It can lead to feelings of loneliness, isolation, frustration, and confusion. It can also compromise your health and safety. Many factors can contribute to hearing loss. As you get older, it can be difficult to distinguish age-related hearing loss from hearing loss that occurs for other reasons, such as genetic factors, trauma or long-term exposure to noise. 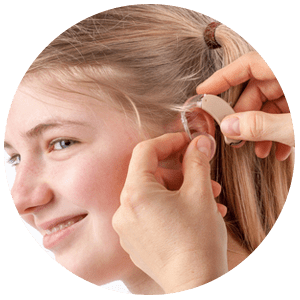 If you have a hearing loss, you can benefit from early identification, education and social support as well as the use of hearing aids. If you feel that difficulty with your hearing limits your personal or social life, the Hearing Center at Collier Otolaryngology is here to help. Meniere's disease is also known as idiopathic endolymphatic hydrops. Its cause is not well understood, but it is thought to be an abnormality in the way fluid of the inner ear is regulated. It has been reported in nearly all age groups, with men and women equally affected. 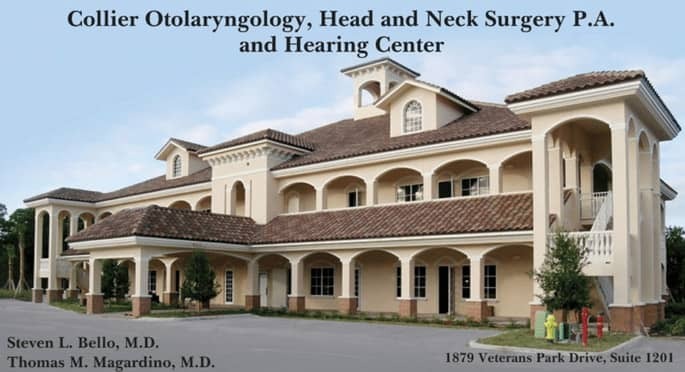 It is essential for you to see one of our Board Certified Otolaryngologists if you are experiencing symptoms typical of Meniere’s disease. The sooner a diagnosis is made, the sooner we can help improve your life. Learn more about Meniere’s Disease at the Collier Otolaryngology Hearing Center. Tinnitus (pronounced tin-NY-tus or TIN-u-tus) is commonly described as a ringing in the ears, but it also can sound like roaring, clicking, hissing, or buzzing. It may be soft or loud, high pitched or low pitched. You might hear it in either one or both ears. Tinnitus is not a disease. It is a symptom that something is wrong in the auditory system, which includes the ear, the auditory nerve that connects the inner ear to the brain, and the parts of the brain that process sound. Something as simple as a piece of earwax blocking the ear canal can cause tinnitus. But it can also be the result of a number of health conditions, including hearing loss and Meniere’s Disease. Some people develop tinnitus for no obvious reason. Most of the time, tinnitus isn’t a sign of a serious health problem, although if it’s loud or doesn’t go away, it can be a source of real physical, mental and emotional anguish. Let us return your phone call. Your request for a callback has been received. An office representative will contact you at the number you provided. Thank you! * Most patients experiencing sinus pain can be seen by a member of our ENT Care Team the same or next day. Call for more information or to schedule an appointment.